Dec. 1, 2013 7:00 p.m. In a recent Alberta Rural Development Network newsletter one of the headlines was, “A Shortage of Lawyers in Rural Alberta?” The article, The Complex Issue of Lawyers, Legal Services and Justice in Regional and Rural Centres written by Melissa St. Dennis, describes the challenges. The following is an excerpt from the article. “Many times the challenges we face in rural Alberta go unrecognized until we directly encounter them. One such issue is access to justice; unless you have ever needed a lawyer or legal services, you have probably never realized the barriers that exist. In Northern Alberta, aside from Grande Prairie and Fort McMurray, only 14 communities have a law firm. Of those, half have two firms or less. And just because it is called a firm does not mean it has an abundance of lawyers; many of the communities in the North have firms with just a sole practitioner. Free access to legal services available to residents of Wetaskiwin. 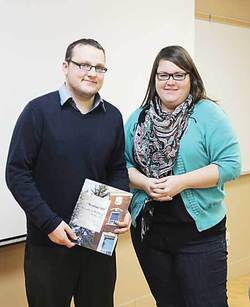 Residents of Wetaskiwin and region learned on November 20th, 2013 they have help. Mr. Ryan Day and Ms. Rochelle Johannson, The Centre for Public Legal Education Alberta (CPLEA), attended the Interagency meeting in Wetaskiwin to provide an overview of free legal information resources offered by CPLEA. Day describes the importance of attending the Interagency meeting. The Centre for Public Legal Education Alberta (CPLEA) is a non-profit organization whose sole purpose is public legal education. They provide information on a wide range of legal topics in a variety of formats. Questions about making a will? They have a booklet that answers common questions. Need information about your rights at work? They have a website with frequently asked questions about the law. Are you a first time renter? They have videos and tip sheets on how to be a smart renter. All of our materials can be accessed for free from their website. CPLEA resources reach many rural communities that would otherwise have little to no access to legal services. Timely access to accurate legal information can help with the prevention of legal problems, and can help to lessen the severity of problems that are already occurring in people’s lives. Last summer CPLEA was busy answering questions and getting information to renters and landlords affected by the floods in southern Alberta. CPLEA publishes a free digital magazine called LawNow (www.lawnow.org) that features articles on family law, employment law, human rights, landlord and tenant law, criminal law, and more. For more information about CPLEA visit www.cplea.ca.